We recommend every 6 months or sooner, depending on how much you're using the water. The NSF 42 standards for the reduction of chlorine, tastes, and odors while retaining vital minerals beneficial to good health. We provided multi packs to meet your different needs. We focus on quality and service, if you have any question please contact us without hesitate. CLICK THE "ADD TO CART" BUTTON NOW AND MAKE A DIFFERENCE IN YOUR WATER! START DRINKING HEALTHIER, GREAT TASTING WATER WITH WATERDROP TODAY! REPLACEMENT MODEL: LG LT800P, ADQ73613401. Kenmore 9490, 46-9490, 469490, ADQ73613402. 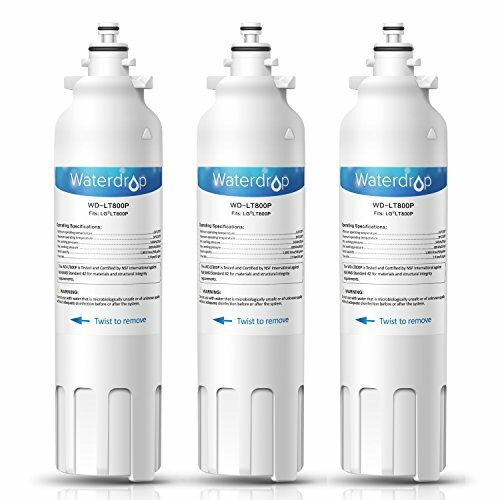 IcePure RWF3500A, Tier1 RWF1160, ClearWater Filters CWMF042, Denali Pure WF-LT800P, Dista DWF-35, Best Choice Water Filters BCF80, Waterdrop is an independent brand.